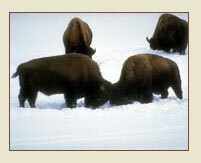 Bison referred to as buffalo - The American buffalo is actually not a buffalo but a bison. The bison was given the name buffalo by the American explorers and settlers because it was a common name given to large wild oxen. The bison looked similar to the cape buffalo in Africa. The true buffalo has thirteen pair of ribs and the bison has fourteen pair of ribs. Bison cannot be bred to buffalo because they cannot produce offspring. The buffalo and the bison both belong to the bovid family. There is a cousin to the bison, called the wisent, that once was very numerous in Europe but today only about 100 exist. The large wild animals like the wisent from Europe and the buffaloes from Asia and Africa that once were so numerous in the world are all classified as endangered species except for the bison, which is increasing by almost one third each year. Because the bison was given the name buffalo by the explorers over 300 years ago, it has become a coined name and is here to stay. 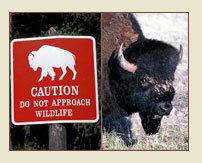 So it is correct to say bison or American buffalo. They have 330-degree field of vision and hearing and sense of smell to be quite exceptional with their hearing range similar to humans. Bison are not confrontational animals. Escape via open space will always be their first choice when threatened. 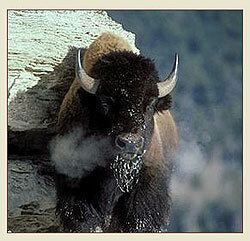 Bison are molting animals which shed their coats in the spring of each year. They have very strong herd instincts and will follow a leader. They eat snow when water is covered with ice.